Hormaku: The purpose of the Mass is that all may come at last to the joy of Nuit. The Great Work is a service to the world, viz., the universe of all life and consciousness without end. To do the work is its own reward. There is no law beyond Do what thou wilt. This shall regenerate the world, the little world my sister, my heart and my tongue, unto whom I send this kiss. A bell may be used to ring the changes before each new section. On a north-facing altar is placed a lamp or candle, incense and a goblet of red wine arranged in an inverted triangle, with the goblet of wine at the apex. If using the Golden Dawn Cross and Triangle, then the cup of wine is placed between the Red Cross and White Triangle. The three sacraments of incense, fire and wine on the altar correspond to the three Mother letters, Aleph, Mem and Shin, and the corresponding alchemical principles of Mercury, Salt and Sulphur. When the chalice is uplifted, the apex of the Pyramid of Light is affirmed, and when it is brought down (from Kether or sahasrara) in preparation for imbibing (Tiphereth or anahatha), the symbol of the Golden Dawn in the Outer is affirmed. The body or host is the body of the Order (or of Thelema) and the celebrants. The wine of the Mass of Hormaku is not the pouring out of blood sacrifice by a man-god but is veritably the elixir of life—the cup of Nuit that is shared by her company of heaven. But your holy place shall be untouched throughout the centuries: though with fire and sword it be burnt down and shattered, yet an invisible house there standeth, and shall stand until the fall of the Great Equinox; when Hrumachis shall arise and the double-wanded one assume my throne and place. Another prophet shall arise, and bring fresh fever from the skies; another woman shall awake the lust and worship of the Snake; another soul of God and beast shall mingle in the globèd priest; another sacrifice shall stain the tomb; another king shall reign; and blessing no longer be poured To the Hawk-headed mystical Lord! DUDU NER AF AN NETERU! I invoke Tahuti, the Lord of Wisdom and of Utterance, the God that cometh forth from the Veil. O Thou! Majesty of Godhead! Wisdom-crowned Tahuti! Lord of the Gates of the Universe! O Thou of the Ibis Head! Thou who wieldest the Wand of Double Power! Thou who bearest in Thy left hand the Rose and Cross of Light and Life! Thou, whose head is as an emerald, and Thy nemmys as the night-sky blue! Thou, Star of the East, that didst conduct the Magi! Thou art the same all-present in Heaven and in Hell! Thou that vibratest between the Light and the Darkness! Rising, descending! Changing ever, yet ever the same! The Sun is Thy Father! Thy Mother is the Moon! The Wind hath borne Thee in its bosom: and Earth hath ever nourished the changeless Godhead of Thy Youth! Who or what, then, are these twin warriors? The serpents of dual power have arisen and are entwined about the axis of the universe; they manifest all phenomena. The shells are broken open by the knowledge of the light and the wisdom of breath. Behold, the breaking forth of the light of knowledge! The Occult Intelligence is the intelligence of hiding or veiling, in that visible nature is Form concealing the Formless. The senses are therefore a seductive veil. The perpetual motion of the twin serpents gives rise to all phenomena. Ultimately, the “twin warriors” must be slain, stilled or silenced through the art of yoga so that Reality obtains. The universe is a play of love. The love of wisdom is the key of it all. Every action and deed is an extension of the will to love or unite with another. For the seer, the desire to unite subject and object is an expression of the will to die to oneself so that consciousness may achieve transcendence to a higher plane. Thus, the expansion of consciousness requires the destruction of thought. Ishtar, Astarte, Venus, Aphrodite, Qutesh, Ashtaroth, Nuit-Babalon! By whatever name I call thee thou art nameless to eternity. O Thou! Bearer of the Tree of Life from which the gods were sprung. Keeper of the sacred bough! Thou who bearest the twin serpents, who art bedecked with flowers! Thou art the oracular power, and the secret knowledge—thee, thee, I invoke! Beautiful one, who standeth upon the lion! Priestess of the Lotus who holdeth the magick mirror. Thy body is adorned with jewels, or stars. Thee, thee, I invoke! Come forth, o children, under the stars, and take your fill of love! I am above you and in you. My ecstasy is in yours. My joy is to see your joy. With the God and the Adorer I am nothing: they do not see me. They are as upon the earth; I am Heaven, and there is no other God than me, and my lord Hadit. Invoke me under my stars! Love is the law, love under will. I give unimaginable joys on earth: certainty, not faith, rest, ecstasy; nor do I demand aught in sacrifice. O wingèd snake of light Hadit! Raise the palm of your hand as in a salute, pressing the thumb into the palm; press together the first and second fingers, and the third and fourth fingers. The sign of “Two” is thus formulated. My incense is of resinous woods and gums; and there is no blood therein: because of my hair the trees of Eternity. Trace a circle over the goblet and within the circle inscribe an invoking pentagram, so the lower angle points directly into the wine. The Officiant: Do what thou wilt shall be the whole of the Law. Drink some of the wine. If there are other celebrants, the wine cup is passed around from one to another in a widdershins direction. Ensure that some wine remains in the cup. Blessed be thou, ye spirits of Air! Blessed be thou, ye Spirits of Spirit! Drain the dregs of the wine; replace the cup on the altar. All: Raise hands and press the palms of the hands together, forming an unbroken circle of force. Allow the force to circulate around the central axis. Break hands and all face outwards, each raising both hands to send the blessing outwards through the opened palms—so projecting the regenerative current beyond the circle even to the ends of the universe. May the whole world come to this joy, now and forever more! May all spirits that have attended upon this ceremony of the magick of light, return now in peace to their natural abodes and habitations. With all thy brilliance decked. Konx Om Pax. Khabs Am Pekht. The Star of Man. The Night of Pan. 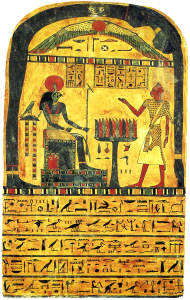 The Officiant makes the mudra of Horus the Enterer followed by that of Silence. In Nomine BABALON, I declare this Temple duly closed. 1. “Unity uttermost showed, I adore the might of thy breath! Supreme and terrible God, I, I adore thee!” This is an invocation of Ra-Mentu (Menthu, Horus-Set or Typhon). 2. From Liber Israfel, based on an invocation to Tahuti by Allan Bennett. 3. We give the correct wording for this verse. See Fill or Kill, That is the Question (article). 4. When this rite is done with a group of Initiates, then all others respond to the mudra of the Enterer with the mudra (or sign) of their grade. Officiants also give their grade mudra. All then make the mudra of Silence or Hoor-pa-kraat. The Mass of Hormaku is the Mass of the Sphinx of Nature, in which the Material Basis is transmuted into the Sum Bonum by the Holy Guardian Angel. Hormaku is called Hrumachis in the Egyptian Book of the Law, II: 34. 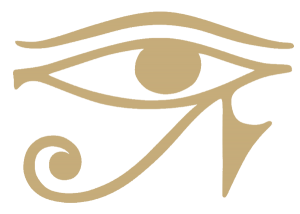 Hormaku means “Horus of the horizon” or Horus of the sky”. © The Liturgical Mass of Hormaku is published, fully annotated, in Liber 373—Astrum Draconis. Subscribe to our 93 Current monthly Journal. The journal is free of charge and is delivered by email.